How would you like to be guaranteed you will receive rent every month? 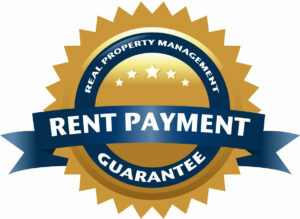 Well through Real Property Management’s exclusive “Rent Payment Guarantee Program,” now you can. We are so confident in our services and experience, we are willing to guarantee it. Those who participate in this revolutionary program will rest easy knowing that they are protected if the tenant doesn’t pay. Through this revolutionary new program Real Property Management is able to take the risk, and fear out of being a landlord. The stress and anxiety caused when a tenant doesn’t pay rent can be overwhelming. Add on top of the lost revenue eviction, and turnover costs like repairs and carpet cleaning, landlords often struggle to pay bills. This program eliminates all of that. For less then the price of your daily coffee, you will have someone protecting you and your investment. Speak to a representative today and let Real Property Management Salt Lake City take the risk out of owning a rental property. We let our performance speak for it’s self, and we guarantee it. For more information about property management. Click here to enter our Education Center.